Our Milky Way Galaxy is not alone in space. There are a number of smaller satellites which orbit around it, and, a bit farther away, several other big galaxies with satellites of their own. We call the forty or so galaxies in our neighborhood the Local Group. Let's look at some of the members. In the southern hemisphere of the Earth, one can look up at the sky and see two of our closest neighbors without a telescope. 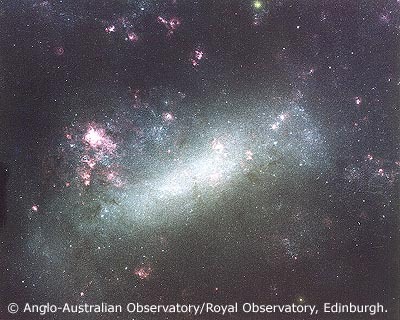 They look like faint clouds in the sky: the Large Magellanic Cloud or LMC (on the left in the picture above) and the Small Magellanic Cloud or SMC. What sort of galaxies are these, and what kind of objects do they contain? To answer these questions, let's look at each one at a range of wavelengths. First, the LMC. A pretty color picture shows a mixture of bluish stars and reddish wisps of gas. How far away is the LMC? You can use measurements of its RR Lyrae stars to calculate the distance. 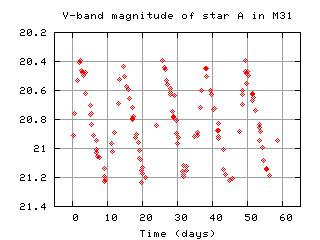 Here's the light curve of a typical RR Lyrae star. your answer in parsecs and in kiloparsecs. Let's compare images taken at different wavelengths, starting with another visible-light image. Click on the picture to see images at other wavelengths. All the pictures are 2 degrees across. Let's again compare images taken at different wavelengths. The Andromeda Galaxy is the largest member of the Local Group, bigger even than our Milky Way. One can see it with the naked eye from a dark site in the northern hemisphere; if one uses binoculars, one can see it spread over more than three degrees of the sky. Views at different wavelengths tell us where we can find interstellar gas and dust in this galaxy. 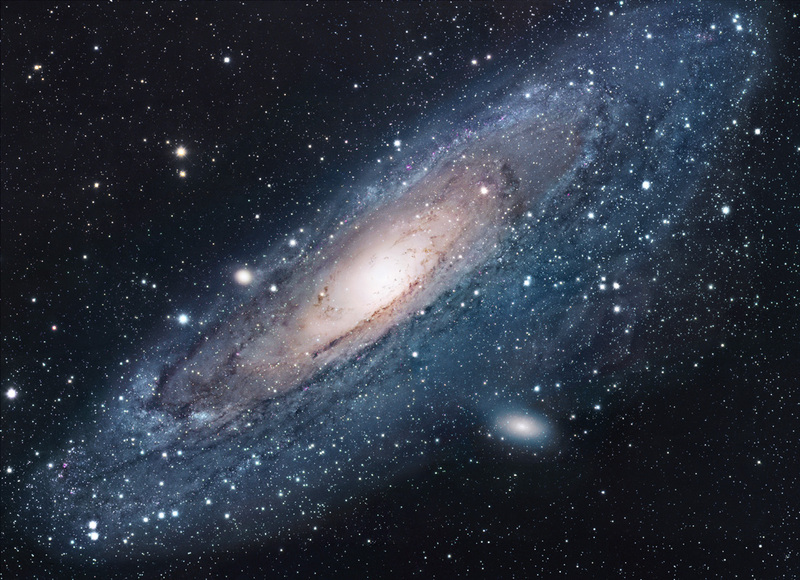 How far away is the Andromeda Galaxy? Once again, we can use RR Lyrae stars to find out ... or we can try using Cepheids. 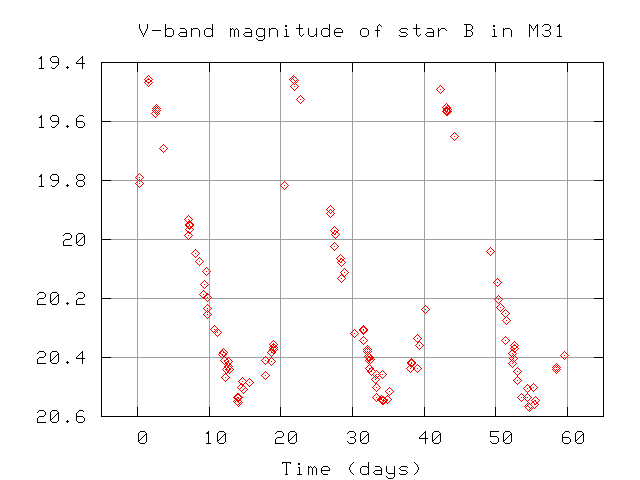 Here are light curves of two stars which might be RR Lyrae variables. The data were taken in 1985 with the 3.6-m Canada-France-Hawaii Telescope on Mauna Kea. The period is written in the upper right corner for each star. 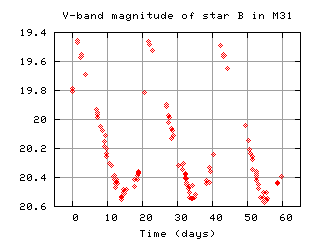 And here are the light curves of two Cepheid stars, based on CCD measurements made by the DIRECT project. 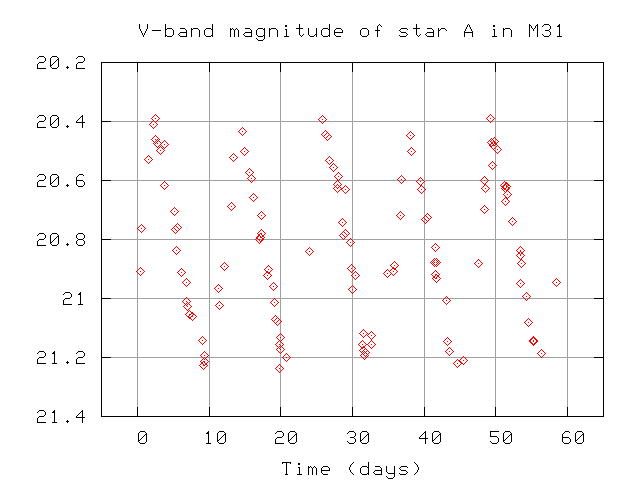 Q:  How far away is M31, based on the 2 RR Lyrae stars? How far away is M31, based on the first Cepheid? How far away is M31, based on the second Cepheid? Let's look at each one, up close and personal. The following images are much more magnified than those of M31; each one is only one-quarter of a degree on a side, twelve times smaller than the pictures of the Andromeda Galaxy. Next, M110, which is a bit farther away from its big companion. 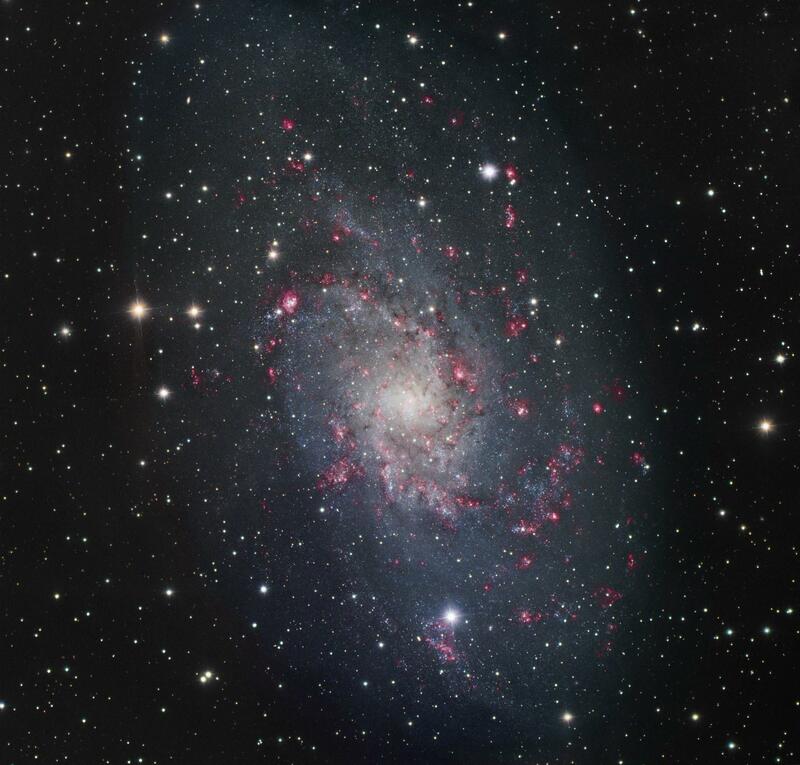 Examine M33 at different wavelengths. Each image is 1 degree across. One can learn quite a bit from color photographs in the visible range, too. (*) Okay, so there are only pictures of 4 dwarfs here. 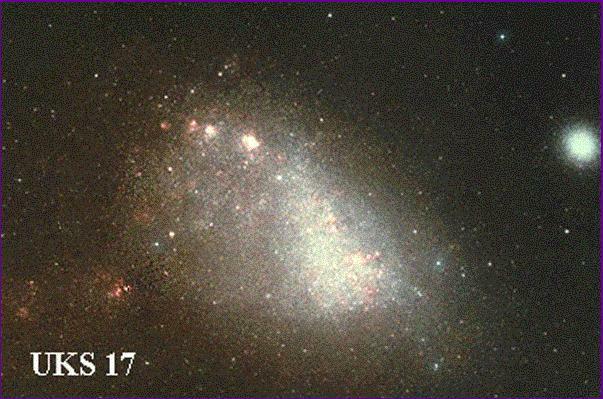 A recent census finds over 25 dwarf galaxies in the Local Group. Taken from "An Atlas of the Universe"
This is only one of a series of maps which allow you to zoom in as far as our Solar System, and out as far as a large fraction of the visible universe. Another good reference is the SEDS page on the Local Group. What creates the X-rays coming from M32, the dwarf elliptical companion of Andromeda? Lowenstein et al. (1998) argue for a single binary star with accretion disk.